ZOLL, the biggest and only full resuscitation company in the world developed a ZOLL LiveVest defibrillator what makes it possible for somebody to survive a sudden cardiac arrest, because this LifeVest defibrillator constantly monitors he heart of the person who is at risk and gives an automatic shock when needed. Gisselle Castro, a 16 years old student couldn’t walk for 6 minutes straight. Her heart function was so poor that she became too winded and tired to complete a six minute walk. She was suffering from dilated cardiomyopathy, or heart failure. 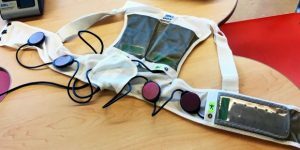 “Doctor Papez said the vest works just like an AED that you see at the airport or the gym. He said the only difference is the vest is constantly monitoring Castro’s heart and will apply a shock on its own if the heart gets out of rhythm. About 11 days after Castro went home from the hospital, she experienced a sudden cardiac arrest. Castro’s mom, Gricelda Quintero, says Castro was in the room with her sister when the incident happened. “The first thing that came to my mind was she was having a heart attack… Her face started getting purple and then kind of pale. She just looked at me and closed her eyes, and that was it,” Quintero said. Her mom said after a few seconds Castro came back, and she knew the vest was working. “A couple seconds later it happened again,” Quintero said. “So she went back and I thought she was gone.” The LifeVest delivered another shock and brought Gisselle back. According to Papez, the vest shocked Castro a total of four times during the cardiac arrest. Castro came back to Phoenix Children’s Hospital after the incident, and doctors installed a permanent defibrillator. Even though she doesn’t wear the vest anymore, Castro said she still isn’t a 100 percent. She is currently waiting for a new heart to make sure she doesn’t have another cardiac arrest. We hope that this kind of technique will be embraced by society as it is a perfect solution for people with heart disease. Contact us if you are interested in this product!